Alarm Grid Is permitted to do alarm monitoring in Wichita, KS Under License #165. Alarm Grid's monitoring responsibilities extend to areas all throughout the United States - including the great heartlands. We are honored to be monitoring the alarms of clients in Wichita, KS under the permit granted to us by the city. For current regulations we remind Wichita residence to please check with your city's police department. We do our best to keep up with regulations throughout the United States, but occasionally our database is out of date or incorrect. It is the responsibility of the homeowner to make sure that their security system is in compliance with local regulations. We do our best to make that a simple process, but if you find that our municipal database has inaccurate information we ask that you email support@alarmgrid.com with that information so that we can quickly correct it. Alarm Grid Is permitted to do alarm monitoring in Albuquerque, NM Under License #820. Albuquerque, NM is a municipality that requires the registration of local security systems with the city. Alarm Grid submits a list of new clients as soon as you are activated. At that time, if you are interested in a homeowners insurance discount for your system, once activated please let us know the name and email address or fax number of you insurance provider. We will send on a certificate of insurance as soon as we confirm the reception of signals. For those in other New Mexico municipalities, please explore the Alarm Grid places database for information on your specific locale. Every location has different rules and regulations. However, it is your responsibility to know the rules in your specific location. While we do our best to maintain a comprehensive, up-to-date database of all locations in the US, with more than 9,000 locations, there is no guarantee that our information is the most recent information. Please check with your police station to confirm that our displayed requirements for your location are both current and accurate. In cases where you find out-of-date data, please email us at support@alarmgrid.com so that we can update the municipality right away. Sometimes having security cameras means seeing some unexpected things. 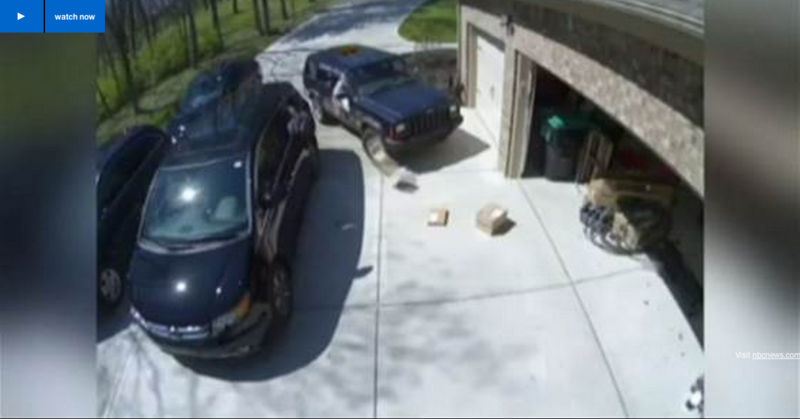 In Scott County, KY, the Smith's caught a postal worker throwing packages onto their driveway. The homeowner, Jill Smith, described what the video caught as astounding. At Alarm Grid, we're very proud of our postal workers. After all, they deliver a large number of the packages we sell every single day. This video is not representative of their work. That said, it does provide a pretty compelling example of why having outdoor cameras is not a bad idea. While they can be used to see who is at the door, or to give a homeowner forewarning of an intruder or approaching danger, you just never know when you'll need a glimpse of something incredibly unusual happening right in your own driveway. If you are using Total Connect, and are interested in installing a camera outside of your home, the IPCAM-WO is just what you're looking for. DIY Security is Better for the Environment! We don't pull a lot of punches here at Alarm Grid. We aren't a huge fan of all the other company's business model. For more than 50 years, this industry has relied on the deceptive practice of tricking their users into signing long term contracts, even renewing them without notice. If you don't pay, they work their darndest to ruin your credit. We do our best not to waste paper. Alarm Grid stores its documents electronically, in the cloud. Our office isn't filled with giant filing cabinets filled with reams of paper. Nope, we are just a group of people working hard giving you great service. Most security companies give their installers a giant vehicle filled with heavy-duty, power sucking equipment. Alarm Grid doesn't have anything like that. If you need help, you can get it easily and quickly from one of our techs over the phone. Unless you insist on it we will not send over a tech just to take some sticky tape off of a wireless door sensor and put it on a door's frame. Not only is that not efficient, it's not a good use of our tech team's time. For those that are ready to replace a door or window sensor, calling a tech over is incredibly inefficient. We are strongly opposed to explaining to every single person how to do the same, very simple procedure again and again. It's not your fault that you don't know how to install a door sensor. But it is our fault if we don't do our best to make it very simple to teach you how to do it since it's so easy. We subscribe to an intelligent customer philosophy: you are definitely smart enough to learn how to get your system up and running. For that reason, we have made hundreds of videos showing you how to use your system. It's not that we don't want to talk to you. We just want to make sure that the conversations we have with you are lively and filled with information that will help you with your unique situation. The other, easy stuff like programming sensors to doors, it's far more efficient when we make a video that hundreds of you can take advantage of! And we're glad to do it (even if it means that customers who are monitored by other companies get to take advantage of our resources). Alarm Grid doesn't hire a team of salesmen who work on commission. Our techs are instructed to give the best advice to the customer, and to work through any challenges that are encountered not simply by selling more and more equipment, but by using the equipment you have at hand. That doesn't mean that we never recommend new equipment, or that to get your system online, there won't be some small expenses you need to incur, but we believe very strongly in never recommending equipment that our customers don't need. That means we do our best to minimize your waste. As electronics fill up landfills all over the world, Alarm Grid is doing its part to make sure that the waste that results from your system installation is minimized. If you've read this much of the post, you probably aren't new around these parts. And if you've looked through Alarm Grid's site before, you know that we strive to be efficient in all aspects of what we do. We try to get you content efficiently, we try to get you checked out efficiently, we try to make sure that you get everything you need done quickly and efficiently. If you've checked out on our monitoring side, we hope that you've noticed how incredibly efficient that process is as well. You check out, you pick a date and time on a calendar, and then we get you signed up. The time we spend on-boarding you is small, and we hope that the frustration is nil. If you think there are ways that Alarm Grid can be even more green, we'd love to know in the comments below! ISC West Names Honeywell L7000 "Best in Intrusion Detection and Prevention Solutions"
It hasn't even been released yet, but Honeywell's newest intrusion detection system, the Honeywell L7000 is already making waves at ISC West winning this year's award for Best in Intrusion Detection and Prevention Solutions. The award is nothing to sneeze at considering the stiff competition presented by others at the security industry's biggest, most important conference. While the system itself has yet to be released, this reward speaks volumes to the quality of hardware and software that Honeywell is putting out. Simply put, what it means is that when assessed against every other major security system, the L7000 comes out on top. We still have no indication from Honeywell when the L7000 and the very similar, but slightly less full-featured L5200 are going to be released for public consumption, but the instant that they are, we will make the products available here. If you would like to be notified personally when the L7000 is released, please sign up for the newsletter on its page. TC 2.0 Updated Ahead of L7000 and L5200 Release! For the last 2 years, the LYNX Touch L5100 has been Honeywell's state-of-the-art wireless security system. But as advancements in technology have come a long way, it has finally come time for them to begin obsoleting the system and putting out two new systems that are a little bit bigger and little bit better. There has been very little data released about the new L7000 and L5200 they are planning on releasing, though we are attempting to report everything that comes across our desk, which is why we were so excited to see what was in the notes on this morning's Total Connect 2.3.40 update. Along with a host of bug fixes and updates, Honeywell has an entire section outlined in the "What's New" section under the heading: "The following features also available; supported only with LYNX Touch 5200 or LYNX Touch 7000 series systems." The following is the list of L5200 and L7000 only features that were just added to Total Connect. ​Does the home security Industry have a bad hardware problem? One of the things I've blogged about before is the onslaught of companies attempting to fix the hardware problems in the home security industry. Generally it's outsiders looking in, and viewing the industry's problems as an un-nuanced set of issues that are easily solved. Well, I hate to say it, but hardware isn't where home security companies or consumers, for that matter are lacking in choices. While, at the moment, Alarm Grid retails exclusively in Honeywell products, there are an incredible number of other brands producing high-quality security systems: 2GIG, GE, DSC, Napco, and more. While each of these systems differs slightly in functionality, the reality is that they are all very very similar. The industry has, for the most part, decided on what is needed on the security side and made them work. In recent years, these systems have begun to do much more than just security as well. Some of them can be used as pool controllers, full-functioning home automation controllers, garage door controls, and more. Being an old-time Minnesota boy, I know about obscure companies like Val, which make a system called the Gain-Trac that monitors and controls poultry houses. Some of the technology that these little shops are making are really neat - the Lockitron comes to mind. But most of them fail to actually solve any of the problems that they claim to be solving. The Lockitron remotely locks and unlocks your doors, which is an amazing feature. They even give you a smartphone app if you want to do it remotely. Well, it's fine, if all you want to do is expensively open and close the deadbolts on your house. There are a hundred reasons I can think of that a person might want to do that. But if you're going to spend the money to do that, why wouldn't you purchase a Yale Z-Wave lock and use an app that integrates all your devices? Do consumers really want one app for every single device in their home? The answer, to date, has been a resounding "no." That said, with relatively little effort companies like Lockitron could open up their technology to be Z-wave compatible. The fact that they haven't done that indicates to me that they don't intend to open their product up to that market. And while we wish companies like them the best of luck because we like the quality and kind of product they are making, their model is narrow minded and the result is that they have solved a problem that is too niche to matter to very many people. In the last year, I can think of four different projects that have been crowd-funded to solve the problems inherent in the alarm industry. For the most part, however, the problems they are attacking are not that significant. Some of them claim they are making aesthetically pleasing security systems, others claim that they are giving you power over your devices. But almost none of them are UL certified, almost none of them can be turned into an actual monitored system, and in numerous small-market systems, you have to change the batteries in your sensors multiple times a year. Other companies that claim they are solving problems in the security system do it by making a proprietary system that can ONLY be monitored by them. So while they seem to have a good understanding of the industry's breakdowns, their solution is nothing more than veiled participation in the industry's problems. If they claim that the industry suffers from dishonest alarm monitoring contracts that require a fee when you try to get out of them, how have they solved anything by forcing you to buy a system that is useless if you don't use their service? What do you think happens when you leave them? You have to buy a brand new system. $500 to get out of a contract... $500 for a brand new system.... Their customers seem to feel better about the proposition, but the math is the same, and on the other end, the amount of money spent to get out of the service is almost the same. Those companies will say that they are "doing away with contracts." But they don't tell you that they are trapping you with a system that is a no better than a brick if not being used on their network. Whenever one of these companies comes to market with a security product, I'm regularly asked, "what is going to happen to Alarm Grid?" This is what I say: "Alarm Grid is setting out to solve the industry's real problems: dishonest sales techniques, bad customer service, a lack of access to information about your system, constant scams, and more. We are not focused on competing with companies to create a new piece of neat hardware or forcing companies to use our service." And we stand by that. Check out our reviews. You will see that Alarm Grid's only goal is to make our customers very happy with the service they have received. Our website is replete with information, not because we don't want you to call or ask a tech, but because most of the time, you don't need to. Our goal is to advocate for our consumers, by empowering them with information. How can you make a good decision about what hardware you should use to protect your family and property if you don't know anything more than how to arm and disarm your system? And that actually is the reason that most of these hardware companies never get off the ground in a significant way. Their systems are nowhere near as advanced as the systems that already exist. The problem with the systems that exist is that consumers don't know how to use them. Luckily for all of you, Alarm Grid is out to change all that! Last week, Yahoo made a change to their DMARC policy. DMARC stands for Domain-based Message Authentication, Reporting and Conformance. It is an email authentication method meant to curb spoofing of email addresses and other abuses. On the surface, this change seems like it might be a positive one. After all, who among us does not hate email abuse? But in practice, the change had a lot of unintended consequences. The change that Yahoo made no longer allows their emails to be sent from outside of their system. What that means in practice is that if you send an email from a yahoo address to an email address whose provider checks against DMARC (which is most reputable email providers), the email will not get through. You may never be affected by the DMARC change, then again, you may have already been affected and not even known about it. If you sent an email from a yahoo email address in the last week to Alarm Grid, for example, we didn't get it. The reason is that when you send an email to support@alarmgrid.com, the way it works is that it goes from your email to a ticketing system, that ticketing system then forwards your email to our techs who use Gmail. Gmail sees that your email was sent from a Yahoo address, but that it was forwarded from our ticketing system, checks the DMARC policy, then rejects your email because it wasn't sent directly from the Yahoo address. As you can imagine, this has been a major headache for us being that we are absolutely 100% about customer service, and this change has caused us to miss a massive numbers of questions and requests from our customers. So we wanted to apologize to anyone who sent us an email in the last week from a Yahoo address. We were not trying to ignore you, we simply did not see your email. If you are one of Alarm Grid's customers that this affected, you should be receiving a response to your message promptly as they are sitting in our ticketing system and we are auditing missed messages as we speak. That said, since Yahoo seems to be uncommitted to resolving the havoc-wreaking issue caused by their change, even lauding this adjustment as a pioneering change that the rest of the industry is sure to follow, we recommend that you strongly consider changing your email from Yahoo to a provider that, as of yet, has not made unilateral decisions that break the way most people use the internet. Internally at Alarm Grid, we use Gmail. It is free, its storage capacity is incredibly large, and it's functionality is better than any paid service we have yet seen. Even so, there are plenty of other services out there that are both free and very functional. Going forward, while we will do our best to make sure that all emails are answered, it is our belief that your life will be made much easier if you begin the search for a new email provider. As Honeywell gets ready to release their newest security system, there has been very little released regarding its functionality. Fortunately, ahead of schedule, we have received one of their beta version of the L5200, which we are excited about testing at the Alarm Grid lab. Since we have yet to test it out, we have very little data about it, so far. What we know is pretty rudimentary, though we will report more as we get a chance to test the unit out. But as you can see by the picture at the bottom of this post, the L5200's hard buttons have been reduced from four to two: the home and the panic buttons are the only press-able buttons on the unit. It came with the same power supply as the L5100, and battery as well. According to the spec sheet we were given, the 4.5 inch Graphic touch display screen supports Alarmnet's IP video cameras, the L5100-WIFI and a GSMVLP5-4G will work with the new units as well as the L5100-ZWAVE module. The spec sheet indicates, however, that in order for the WIFI module to work in the L5200, it must be revision 4.97 or higher. The L7000 has some significantly different specs, though we will report on that as soon as we receive our beta unit.